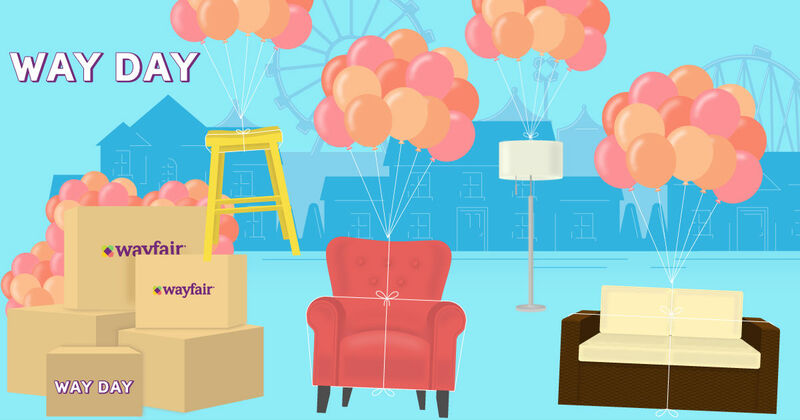 TODAY April 11, Wayfair has FREE SHIPPING and the LOWEST Prices of the Season for Way Day! (a made up holiday much like Amazon's Prime Day).Plus, new Wayfair customers can get 10% off. Wayfair will have new door buster deals going live every 6 hours. Check out the Flash Deal Section - These hot deals are ending soon. I'm spotting drapes for under $8, Sheet sets for $16, Upholstered headboards for $67, and furniture for under $100. Prices are lower than Black Friday and free shipping never happens at Wayfair so we are in for a REAL treat today! Score more than 70,000 home furnishings, decor, kitchen & dining, bedding, rugs, tabletop, mattresses, grills and home improvement items up to 80% off. I'm in the market for a NEW area rug so you know I'll be buying today! I'll also be deal hunting in the clearance section. Also, Wayfair credit card holders who shop Way Day deals will earn triple rewards on all purchases made with their card. I LOVE when retailers compete - the consumers ALWAYS win!